Open to partly shaded rocky woods and rock ledges, usually calcareous. Very rare in Michigan; often larger than our other species, and looking rather like a Cystopteris. Most easily found by searching in late summer after the small Cystopteris species that it resembles have become dormant. The sporadic occurrence of this plant throughout Michigan is unusual, considering its abundance southward. 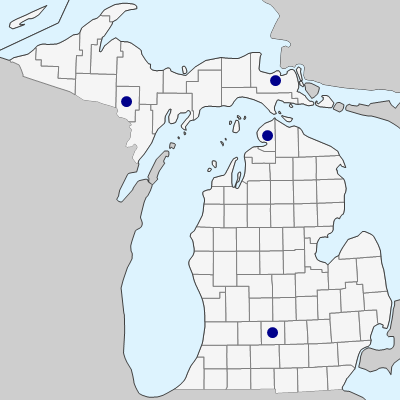 It has not been collected in the Upper Peninsula for over half a century, and the two Lower Peninsula collections, both from areas with some limited rock outcrops, are even older. The Keweenaw County collection by O. A. Farwell (BLH), cited by Brown (1964), is not mapped here as it was dated 20 Aug, 1889, a day when other highly improbable records were allegedly found; these therefore likely to have been the result of a batch of collections from elswehere being mislabeled. Farwell numbered this collection 712, and a duplicate of this number in GH has the date July 1889. MICHIGAN FLORA ONLINE. A. A. Reznicek, E. G. Voss, & B. S. Walters. February 2011. University of Michigan. Web. April 21, 2019. https://michiganflora.net/species.aspx?id=2811.